Improve output and efficiency at your food and beverage plant by automating your production processes. 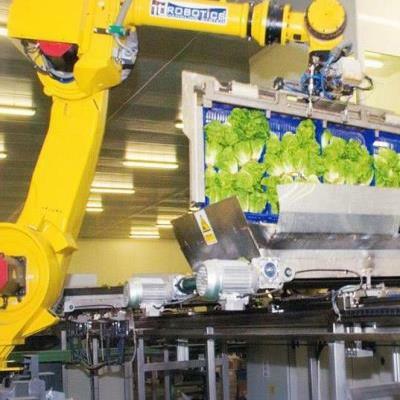 Automating your food or beverages production facilities is easier than you might think. 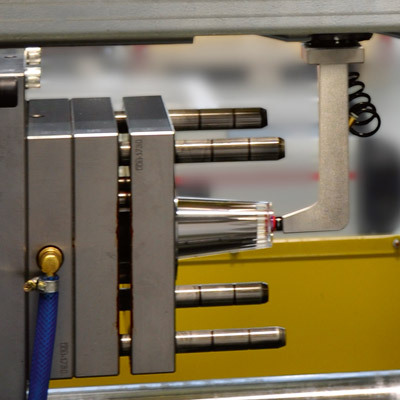 FANUC provides smart solutions to increase productivity regardless of your business’ size. Our great products and easy plug and play solutions make achieving affordable automation along your entire production chain easy. Specifically for food processing automation delivers consistently better quality, improves picking and handling times and increases output by speeding up packaging processes. The net results are lower costs and greater competitive scope. What is more, intelligent specialised automation also allows you to respond flexibly to today’s competitive market dynamics and the ever-changing demands of the food manufacturing industry. Smart FANUC solutions create added value across your entire food and beverage industry manufacturing process. Dedicated to every phase of your production, we support you with front-of-line, processing, picking and handling and end-of-line applications. Optimise your value chain right from the very start of the production process using FANUC front-of-line automation. Whether it's depalletising, loading, line charging or even thermo forming your packaging with an injection moulding machine, any number of tasks can easily be automated to help you improve your food manufacturing processes and lower your costs. No matter what you process, the sheer versatility of automated solutions means getting your raw materials onto the production line is easier than you might think. Industrial robots provide an incredibly efficient way of handling goods at different stages of the production process. FANUC ROBOSHOT is a versatile CNC injection moulding machine that can be used to produce packaging onsite. "Automating is much easier than you'd think. You'd be surprised – we have lots of customers from small and middle sized companies that have successfully improved production using our solutions. We're happy to help guide you through your first steps in automation" Just send us an email or give us a call. The handling of primary and secondary foods and products clearly represents the most delicate stage in the food processing chain. Whether it is slicing, punching, cutting or filling, FANUC’s tailor-made solutions make it possible to automate almost any conceivable handling operation in food manufacturing. As simple as they are cost-effective, FANUC solutions comply fully with food standard and hygiene regulations. 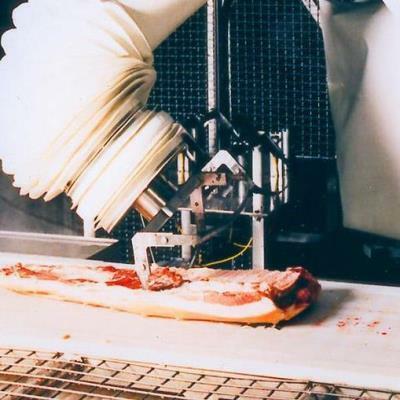 Dedicated food robots perform delicate tasks such as slicing meat to very high degree of accuracy and with less waste. 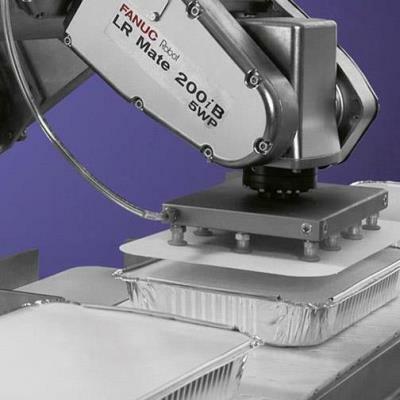 Primary food handling is done by dedicated food and clean room robots equipped with food-grade grease and special coatings. 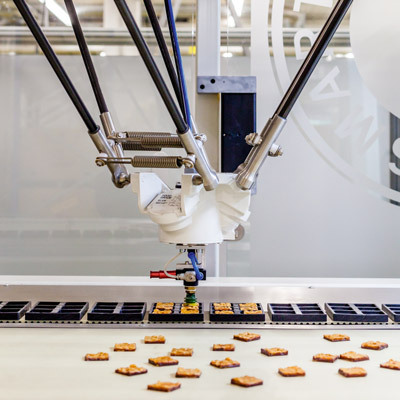 "If you can combine robots with traditional craftsmanship, yet still produce a truely unique product, then there are compelling reasons to automate" says Suteria's Manfred Suter. Discover the full story. Wash-proof robots are easy to clean and offer levels of protection up to IP69K. Food and beverage producers need to keep up with current trends. Automating pick, place or sorting tasks, not only enables you to optimise your production processes but also to react flexibly to new developments, thus staying ahead of the competition. This can be further enhanced by the use of smart visual recognition technology and sensor systems. Ultra fast delta robots are ideally suited to picking and placing operations. 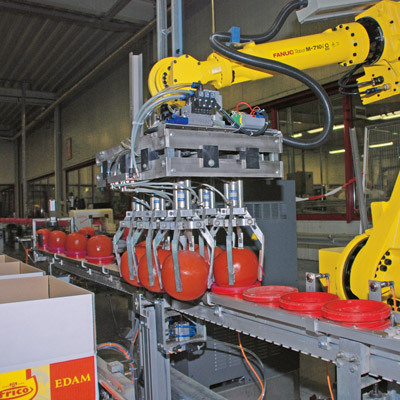 High-speed industrial robots increase throughput on jam packing operations for HERO. 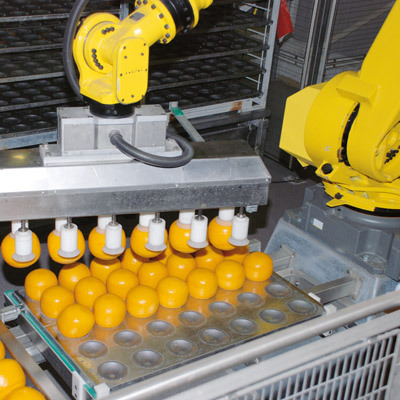 FANUC M3 delta robots pick bananas from a conveyor and place them onto a transport tray. 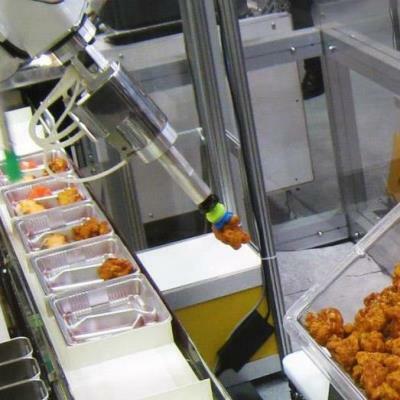 Numerous food picking and packing processes can be automated using mini-robots that mimic the human arm. All FANUC R-30iB robot controllers come with iRVision software and offer plug & play vision support for maximum performance. Automating the end of your production line increases your flexibility, enabling you to react quickly to the trends and challenges involved in providing intelligent and secure good-quality packing, storage and logistics. Wrapping, labelling, packing and palletising all involve strenuous and repetitive manual work – something that can easily be done by automated systems for optimised, cost-effective results. Heavy load applications automated by robots contribute to improving employees' health. Robots remove boxes of jam from a conveyor and stack them on pallets. 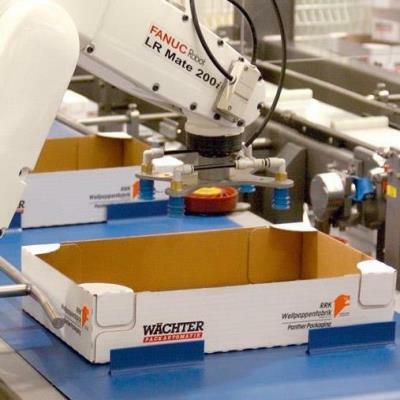 Dedicated palletising robots are ideally suited to handling and transfering heavy products.